The SACU Executive Secretary is appointed by the Council of Ministers for a period of 5 years. The Current ES is Paulina Mbala Elago, a Namibian National and assumed her duties in this portfolio on 1 April 2014. Prior to this appointment, Ms Elago was serving as Country Director for Tanzania, for Trade Mark East Africa (TMEA), where she was responsible for designing, managing and implementation of the TMEA Tanzania`s multi-million dollars country programme designed to support implementation of East African Community (EAC) regional integration frameworks, improving intra-regional trade and trade competitiveness through improved trade facilitation, streamlined procedures and infrastructure development. Ms Elago, has over twenty years of professional experience in International Trade, primarily trade policy, regional integration, trade facilitation, investment environment reforms, trade related capacity building and trade related infrastructure development. 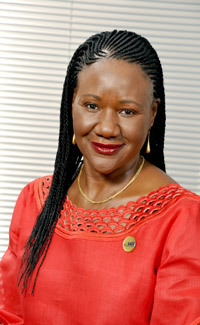 Additionally, she boasts of 10 years` experience in managing and delivering multi-donor, multi-country and multi-year development programmes to support regional integration and trade competitiveness, primarily in Africa, Pacific and Caribbean (ACP) States including institutional support to regional integration organisations across ACP regions. She has also served as Deputy Chief of Party for the Southern Africa Global Competitiveness Hub in Gaborone, Botswana, Economic Adviser at the Commonwealth Secretariat in London and as Chief Trade Negotiator for the Government of Namibia. She has in-depth knowledge and understanding of the trade and Socio - economic context of the SACU, SADC and EAC regions as well as the global arena. SACU is a Customs Union which comprises five countries, namely Botswana, Lesotho, Namibia, South Africa and Swaziland with its Headquarters being in Windhoek, Namibia. It has been in existence since 1910.